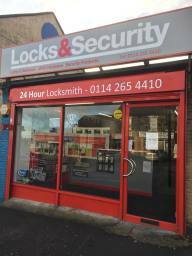 Locks & Security We are a family run business based on Mansfield Road, in Sheffield. We stock an extensive range of locks, security, access control, UPVC repair and alarm products. We offer a five-star rated, 24 hour locksmith service, and also cut a huge range of keys for both homes and businesses. We supply to the trade and public, at genuine trade prices.